Graphic by The Pioneer. 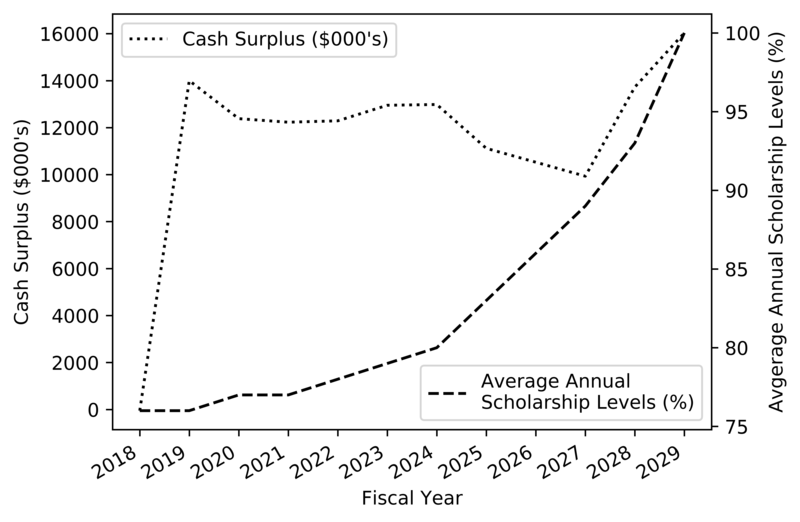 Data from “Recommended Plan to Return to Full-Tuition Scholarships“ by the Free Education Committee, 2018. The plan hopes to raise the average annual scholarship level of 76% to 100% by the 2029 fiscal year. On January 15, 2018, the Free Education Committee of the Cooper Union, or FEC, released a comprehensive plan that proposed a method to return the Cooper Union to a full-tuition scholarship model by 2029. The plan estimates a much closer deadline than the previous estimate of 2039 from the January 2017 Progress Report. The plan is described as “multi-pronged,” requiring a focus on fundraising and expense management. Through small increments over the next ten years, the plan hopes to raise the average annual scholarship level of 76% to 100% by the 2029 fiscal year. The plan mentions that if more than 5% of the financial goals are missed, then the plan must be adjusted accordingly, which, in an “extreme case,” could involve reducing scholarships for future students. Nevertheless, the FEC report states that approximately $250 million is required in order to return to a full-tuition scholarship model. To accrue these funds, the plan calls for a reduction in the average scholarship for graduate programs from 66% to 25%, increasing rentals by 3%, and reducing costs associated with severance payment, all within the 2019 fiscal year. In the 2020 fiscal year, the plan calls for an increase in dorm pricing to $15,000 per year, reducing rental costs at 30 Cooper Square by half, reducing expenses through increased operating efficiencies, and updating employee benefits plans to a more cost-conscious one, for an estimated $1.2 million in savings. The FEC report states that approximately $250 million is required in order to return to a full-tuition scholarship model. The truth of the matter is that the plan proposed by the FEC has inherent risks. For instance, on the matter of increasing dorm rates to $15,000, many first-year students may choose not to live in the dorms. Why pay the market rate to live in the dorms, when you can pay the market rate and live elsewhere? The previous cost for dorm-living was $12,300. In other words, students could previously live nearby Cooper Union at a discounted price. With this plan, the FEC runs the risk of losing future dorm-students. Similarly, by reducing the amount of scholarships available for graduate students, many students may choose not to attend Cooper Union for its graduate engineering programs. The decrease in applications to the program may also negatively impact Cooper Union’s reputation. Although the FEC acknowledges these risks to both Cooper Union’s finances and reputation, the FEC provides a layer of protection against them. For example, the FEC hopes to increase annual ancillary revenue by $250,000 by means of the newly established online store, and improving the continuing education program for maximum profitability. However, the FEC mentions that a risk with this initiative is that the expected revenues may not materialize. As a safety-measure, the FEC hopes to minimize initial investment until proof of concept has been established. The FEC plan outlines the pros and cons of 13 initiatives in this manner, allowing the committee to determine whether the initiative would go in the “Yes”, “No”, or “Bullpen” category. In the end, the FEC determined seven initiatives would be included in the proposed plan, two initiatives would not be included, and three initiatives would be considered bullpen initiatives. Reducing rental costs at 30 Cooper Square was the only initiative that was ambiguous. It was decided to be included in the recommended plan, while at the same time, considered to be part of the bullpen. The complete FEC plan can be found on the official Cooper Union website. As a safety-measure, the FEC hopes to minimize initial investment until proof of concept has been established. The FEC’s plan to return Cooper Union to a full-tuition model outlines the benefits and downsides to each of 13 initiatives. It is now left to the Financial Monitor to review the plan, and the Board of Trustees to vote on it on March 14, 2018.